Trying to use a laser scanner worth tens of thousands of pounds while perched halfway up a 5,725ft (1,745m) mountain is never going to be the easiest of tasks. 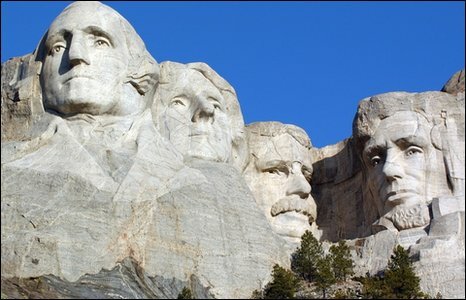 But that is the challenge facing a team of Scottish conservation experts as they embark on a cutting-edge project to document Mount Rushmore using digital technology. The 3D scan, due to begin on 10 May, will capture in intricate detail the famous rock carvings in South Dakota that portray four US presidents. 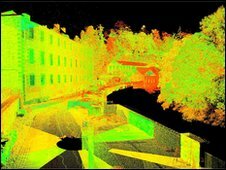 It is the first international site to be recorded as part of a project to create virtual models of 10 World Heritage sites. David Mitchell, director of Historic Scotland's technical conservation group, believes the documenting of the nooks and crannies of Mount Rushmore is likely to be one of the most difficult. "Getting our equipment up there, getting close enough to scan and working with rope teams, it is quite challenging from that point of view," he said. "The challenge at Mount Rushmore is covering all the angles, so we have to get up and onto the chins of the presidents. "There is a tiny little plateau there, so we have to propel the guys across onto this tiny ledge with £80,000 worth of scanning equipment." The daunting task will be carried out over two weeks by six staff from Historic Scotland and Glasgow School of Art. Three teams will work equipped with one laser scanner each, to cover the top of the heads, below the heads and the buildings on the ground. The recording process involves a laser being fired millions of times a second at a surface, which then bounces back and measures the distance. The end result is a precise lasting record of the sculpted surfaces, accurate down to just millimetres. Mr Mitchell said the priority would be scanning the iconic images of the four presidents at Mount Rushmore - George Washington, Thomas Jefferson, Abraham Lincoln and Theodore Roosevelt. But the team will also record many of the historic buildings surrounding the monument, so visitors will be able to take a "virtual tour" on a website. "I got to stand on George Washington's head on a visit, and it was wonderful to look at from that point of view," Mr Mitchell said. "Visitors will never get up there, but digitally we can bring that to them." The scanning of Mount Rushmore is part of the £1.3m Scottish Ten project, funded by the Scottish government, which will document ten heritage sites in Scotland and around the world. In Scotland this includes New Lanark, the Antonine Wall, St Kilda, Heart of Neolithic Orkney, and the Old and New Towns of Edinburgh. Douglas Pritchard, of Glasgow School of Art's Digital Design Studio, said the sites were changing daily due to factors such as the weather. "These sites in the future, such as the Neolithic areas of the Orkney islands, may disappear," he said. "So this is to provide future generations with a very thorough record of what these sites once were." Discussions are also being held to identify potential sites for scanning in India, China and Japan. Mr Mitchell said there had been "enormous" interest in America surrounding the Mount Rushmore project. "It is about is documentation, education and interpretation and the tourism angle, encouraging people to visit the sites or allowing them to visit virtually," he said. "This is a shop window for Scotland and what we can do in terms of technological innovation."